It’s hot and humid. I’m already sweating through my shirt and it’s only 8am in the morning. Still, I gulp my pithy Lombok coffee and hop into a taxi with my girlfriend (Vahimeri) to grocery shop for a barbeque we have been planning for a few weeks. From our expatriate residence in Green Valley, it takes us nearly half an hour to get to Kebon Roek, a typical Indonesian market and a must-have experience for visitors (located in the old port town of Ampenan—adjoined to the island’s capitol of Mataram). After stalling out into the parking area, we give our shopping list a quick once-over before delving into the organised chaos of the 'pasar'(market). The labyrinth of stalls and shops is everything I expected of a traditional market. It’s crowded, hot, noisy and packed with organic and all-natural products. Blasting from a large amplifier, Dangdut (local Indonesian music) permeates the atmosphere. With a quick beat, it sets the pace for gathering our cooking needs. The first stop is the vegetable section. We're on the lookout for carrots, tomatoes, chili peppers, pelecing (water spinach), capsicum and onions, so we head to the second level of the four-storey building. Apparently, this section of the market offers the fairest prices to ‘bules’—an Indonesian word used to describe visitors/tourists. So, after slipping through single file passageways between piles of produce, we settle ourselves at a vendor, and Vahimeri and I begin to dig through waist-high mounds of veggies to find the ripest buys. When we are done searching, the elderly woman working behind the stand weighs our vegetables, and then the bargaining ‘game’ begins until we eventually agree on a price. Next up is the fish area. An inch or so of sludge layers the earthen floor. It’s a combination of water, dirt and—well—I don’t really want to know what else. Unless you like sloshing your feet through that kind of muddy soup, I would suggest throwing on a pair of shoes and socks. Again, the variety and selection is daunting. Everything looks, smells and feels equally fresh. Tip-toeing our way between chopping tables and dead sea creatures, we spot an overflowing bucket filled with fine-looking fish, the variety that looks like it would taste amazing when cooked. We pick up a dozen of the silver swimmers for our guests to enjoy. They are to be prepared over an open flame and on a stick, but not before being sauced with sambal (traditional Lombok chili sauce). As we leave the fish section, I fight the urge to grab fists full of large prawns and squid. My stomach is growling. Another item knocked off the list, we move onto chicken, which can be found in the open-air section towards the back. They’re already plucked and cleaned, and even though flies permeate the air, the birds look sumptuous. We purchase two, but not before the seller swiftly hacks them up into neat pieces with a mean-looking cleaver. We then proceed to navigate the narrow, poorly-lit corridors in search of skewers, which we will use to cook the fish and chicken on. Vahimeri locates these upon stumbling into a random passageway. After a prolonged verbal exchange with the seller, we add a packet of charcoal to our purchase and finally both parties settle on an agreeable price. Finally we are finished! I feel dizzy from the heat, and the aroma of solar heated (it's thirty one degrees Celsius outside) fish and chicken makes my stomach churn. Still, the thumping Dangdut music keeps my body in motion. Shirt soaked with sweat, I reach for my phone, dial the taxi service and wait patiently for the taxi to arrive. Five minutes later, I’m basking in the glory of air-conditioning with a couple of grocery bags filled with the freshest produce, meat, and fish. We’re ready to cook. While gazing out at a blurry panorama through a speeding taxi window, I can't help but think to myself what a fully engaging process it is to shop at the pasar. The five senses are wide open, absorbing and creating reality from the nearly overwhelming sensory input. The pasar, as it should, thrives with energy. After all, that's why people need food. 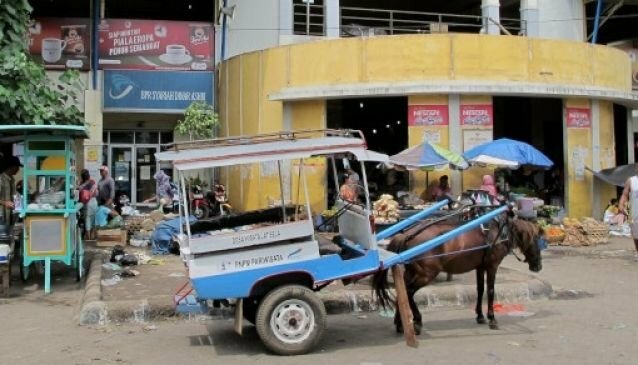 We need energy to survive, and the pasar has more than enough of it. So, it is clear that a trip to Lombok isn't complete without a visit to Koben Roek market.